I feel like I'm in a snow globe. 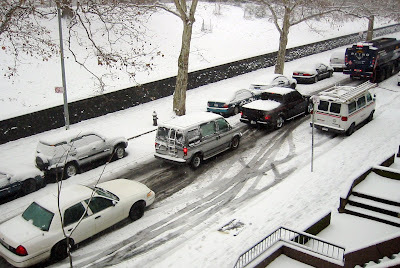 The plow hasn't come by, nor has any vehicle with salt (are they usually the same?). That combination makes for some interesting Auto Ballet shows. I'll never understand why someone would honk and honk and honk when a car ahead is loudly and obviously spinning its wheels trying to make it up a hill. You're in that much of a hurry to crash into parked cars? Thankfully, a couple of oil trucks have gone by and that made two clear rows for future cars to use safely. 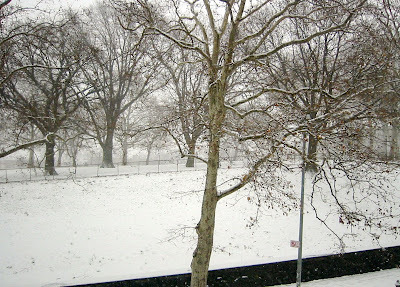 The snow makes the park look especially pristine (I know, doesn't it always? 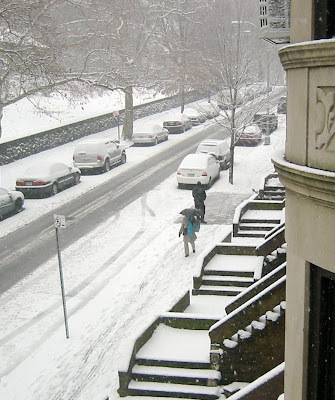 ), and it's too bad I couldn't get a good shot of the shrieking kids who are sledding down the walkway. They are having FUN. Apparently, one of my neighbors is also having FUN. Either he is very attentive to his sidewalk obligations, or he just loves to shovel. Within two hours of the snow starting, he already had his sidewalk area cleared. I think he'll be doing it a few more times before most of the other houses have begun. *Update* Another oil truck clogged up the street with his delivery (to his credit, he pulled over to try and let people by first, but they couldn't get up the street). It took all of six minutes - really - and the numbskull in the van honked his horn the ENTIRE time. Thankfully for everyone waiting to spin up the street, the oil guy didn't pull the passive aggressive attitude I would have, and he continued on his merry way very efficiently. The shoveler from above was out again during the drama. Not to watch, but to...shovel! Beautiful photos! And thanks for the comment earlier, and suggestions on where to get better Mexican food! Happy Holidays!